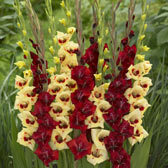 Gladiolus bulbs, also known as Gladioli, are one of the most popular summer flowering bulbs available in Britain. 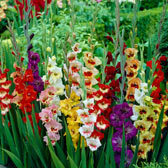 Grown for their exquisite semi-dwarf or tall spiky stems and funnel shaped flowers, they make superb cut flowers and are a must for summer flower arrangements. 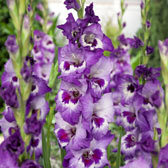 Try planting in succession, two-three weeks apart to continue the flowering all summer long. 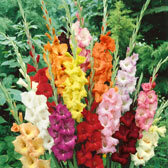 Top quality corms supplied.